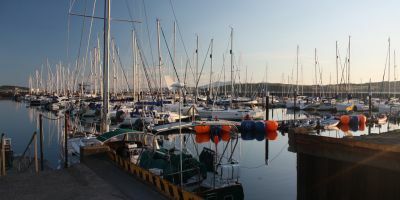 Largs Yacht Haven boasts a huge marina with over 700 berths and full support services - including a warm welcome at all hours of the day from their 24 hour staff! It offers a 70 ton hoist as well as fuel. The marina is accessible regardless of tide and dry berthing is available. The fuel and waste disposal services are excellent and free wi-fi is available. The toilets, showers and laundry areas are easy to reach and kept to a high standard. There is a free car park just across the road to all berth holders. Largs is a beautiful seaside resort town in the Southwest of Scotland. Well known for its rich history, it also provides no lack of tourist amenities. Since the nineteenth century, Largs has been growing ever more popular in the tourist industry and provides links to both Glasgow and the Isle of Cumbrae while also lying on the main A78 road. The Battle Of Largs, which took place 740 years ago, changed the shape of Scotland into what we know today. Up until that point most of Scotland had been ruled by the Norwegians, but it was at Largs that the small Scottish forces triumphed over a larger Norwegian army and reclaimed their land. This event is proudly remembered by the locals, many of who can date their own families back to that time. Almost everywhere in Largs, there is evidence of the rich history that this town offers. Attractions around Largs are easy to come by. Aside from the huge marina and the beautiful beaches, the area is steeped in Scottish History. Kelburn Castle lies close to Largs and was once the seat of the powerful Boyle family. It is one of the oldest castles in Scotland and definitely worth a visit. If the history interests you, there is also the famous Vikingar Centre at Barrfields. This centre offers visitors an interactive look at Viking life as well as numerous other amenities including a pool and soft play area for the kids. The worlds last sea-going paddle streamer also calls at Largs as it carries passengers around and across the Firth of Clyde, worth a look and a picture or two if you get the chance! Oh, and check out the Neolithic tomb located behind Douglas Park. This tomb dates back to around 3000 BC and is known as the Haylie Chambered Tomb! Largs also offers a ferry service over to the Isle of Cumbrae that takes around 15 minutes. This small isle holds the town of Millport as well as a round island road, favoured for family bike rides, and an 18 hole golf course than spans most of the island. The island has been inhabited since the last Ice Age and so boasts an impressive history, most of which can be seen at Millport. The island is mostly flat and holds the smallest cathedral in Scotland, the Cathedral of the Isles. 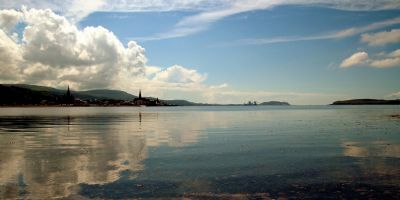 Some local events are listed on www.explorelargs.com. There are many restaurants nearby in Largs but you'd struggle to beat Scott's. The restaurant is right on the marina and specialises in Scottish seafood and local produce - we do recommend booking in advance as they’re generally extremely busy throughout the year. The Bosun’s Table is a great place to stop and pick up a quick lunch or some afternoon tea, and it's actually in the marina complex whilst Nardini’s (on the Largs seafront) offers a large range of simply amazing ice creams to wander around with. Of course, no visit to Largs would be complete without stopping by Iona’s tearoom. This unassumingly beautiful tearoom offers the most delightful cakes and sandwiches at a good price. 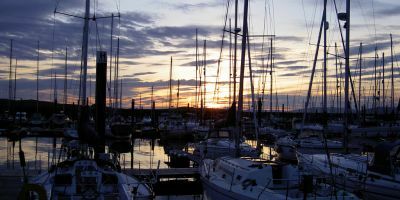 Largs is my favourite place to charter in Scotland, with a large safe marina, cafes and restaurants and bars and a welcoming sailing club, it's an easy place to arrive on a Friday evening in preparation for your trip. The Clyde outside the breakwater is sheltered from most wind directions and gives you opportunity to sail even in inclement conditions. You've the choice of dozens of directions to explore, and a great weekend for me would be to get out on the first evening and across to Millport on Cumbrae where you can pick up a mooring before going ashore in this old fashioned holiday village. From there head south to explore Arran, finding a mooring or anchoring in Lamlash bay, tucked in behind the Holy Isle. April to October you can visit the Buddhist retreat or walk across this tended island to see the views from the top. Alternatively you could visit Loch Ranza with its whisky distillery and Castle at the end of the loch. Beware this can be a bit blustery in south easterly due to katabatics down the valley. A traditional breakfast and a sail back to Largs would finish off a lovely weekend. Long / Latitude: N 55° 45' 58" W -4° 50' 59"
The nearest airports are Glasgow Prestwick and Glasgow International airports, which are 85km away. Taxi’s can be arranged to take you directly to the marina, or you can use public transport to head into central Glasgow and out to Largs by bus or rail (see below). Trains are scheduled to run from Glasgow to Largs every hour during the day (Check www.thetrainline.com for specific times and prices). The railway station is a 10-15 minute walk or a short taxi ride from the marina. Buses run from Glasgow centre to Largs (the Number 901 is the fastest service). They are cheaper than the train, but take longer than the train. From the town centre, it is only a 5 minute bus ride or a 3 minute car journey to the marina in the south. To walk would take around 20 minutes along the coast, something I’d advise on a nice, warm day. 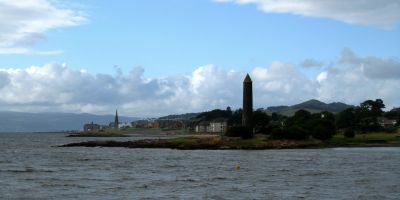 Largs is approximately one hour’s drive east of Glasgow, and can be reached by taking the M8 and A760. Free car parking is available at the marina.